Even though it's become vastly more efficient and effective to digitize work processes over the past few years, they're still stuck in the past, printing off reams of documents. It's unnecessary paper use that wastes resources, undermines productivity, bogs down workflow and prevents companies from realizing competitive advantages derived from becoming digital enterprises. There's a huge anchor holding many Canadian firms back from being more competitive. Think of it more as a giant paperweight keeping them down. Companies are literally being buried in an avalanche of paper. Even though it's become vastly more efficient and effective to digitize work processes over the past few years, they're still stuck in the past, printing off reams of documents. It's unnecessary paper use that wastes resources, undermines productivity, bogs down workflow and prevents companies from realizing competitive advantages derived from becoming digital enterprises. For a company that made a name for itself by inventing the photocopier, you may think it's ironic that Xerox is alarmed by the continued overuse of paper in the workplace. But Xerox has a history of innovation that stretches back more than a century, all of it focused on revolutionizing the office and helping companies become more efficient and productive. A recent study we conducted on the use of digital tools and practices -- Digitization at Work -- found many organizations still have a long way to go to cut their ties with paper. We found that more than half (55 per cent) of the respondents admit their organizations' processes are still largely or entirely paper-based, and about one third (29 per cent) are still communicating with end customers via paper, rather than email or social channels. 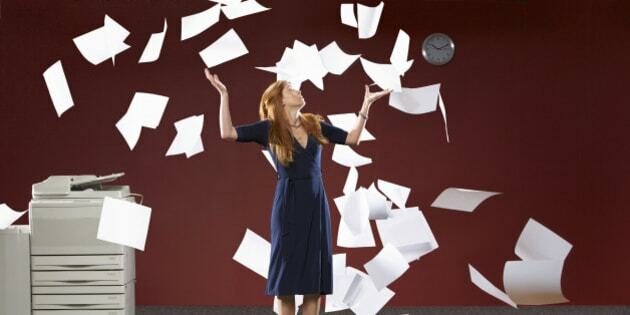 Only a small fraction of companies -- 10 per cent -- are essentially paperless across the board today. This is despite the fact that 41 per cent agree moving to digital workflows will cut organizational costs, and 87 per cent appear to have the skill sets available to make this happen. The survey showed that Canadian companies are generally ahead of their global counterparts in digitizing processes in the areas of invoicing, contracts, customer engagement, HR on-boarding, new product development, and vertical and operational processes. Approximately 44 per cent of Canadian respondents said they will have all seven areas digitized in two years -- the highest among all countries surveyed. The findings are fascinating. They show that while most organizations have the desire to become more lean and agile for the digital future, they simply don't have the processes in place to shed their paper ties. There's a disconnect between an organization's vision and the steps required to achieve successful digital transformation. It's this stumbling block that stalls their ability to capitalize on the competitive benefits of going digital. How do organizations get over that hurdle? The place to start is print analytics -- understanding why and where employees are using paper. Most documents today originate on a computer, a tablet or a smart phone -- digital devices that offer easy sharing and storage. So why would anyone feel the need to print them? Yet, they do. Canadian executives told our researchers they still print documents for hard copy reference (69 percent), signatures (65 per cent) and sharing (48 per cent). But we found many organizations are skipping this crucial step in their haste to keep up with the digital crowd. They're trying to digitize before the data is in, which means they're starting off on the wrong foot. Without the right data in hand on print habits, it's difficult to uncover the hidden opportunities for digitization. You're stuck guessing on what might work, which is never as reliable as well-analyzed data. Armed with solid print analytics, company executives can then make informed decisions about optimizing or automating key processes. That's how they'll realize the big benefits of digitizing, including cutting costs, becoming more agile, improving document security and providing faster, more effective service. It's time we all make a greater effort to make paperweights a thing of the past.